Pictures from events held during the Golden Jubilee celebrations will be added to this page during the year. Until this page is updated, please visit our Facebook page for a selection of pictures and updates. And don’t forget to review the photographs of the presentations of the fifty Alumni Friends Golden Jubilee Bursaries (click here). 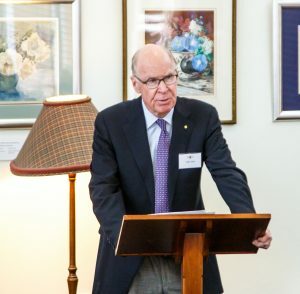 May 2018: Adjunct Professor John Story AO, 2017 UQ Alumnus of the Year and former UQ Chancellor, speaking at the 52nd Alumni Friends AGM. October 2017: Pictured at the RD Milns Exhibition Openings (50 Years of Giving & Patronage: Emperor and Empire), L to R: Dr Janette McWilliam, Victoria Crossland, India Dixon, Em. Prof. Robert Milns AM, Mrs Lyn Milns, Georgina Jansen, Alexandra Garavelis, James Donaldson, Kaeli Krakowski. Alexandra and James curated ‘50 Years of Giving,’ and Janette supervised the student interns (Victoria, India, Georgina, and Kaeli) in the curation of ‘Patrongage.’ Picture credit: Geoff Lawrence. October 2017: Members of Alumni Friends attending the UQ Courting the Greats ceremony for the presentation of special awards to UQ Alumni. 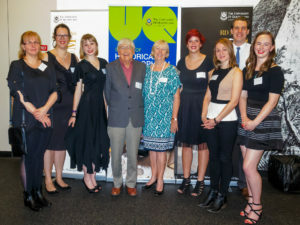 Recipients included Mr John Story AO (pictured second right, front row) and Kaela Armitage (pictured third right, front row). 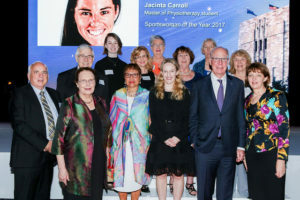 Kaela (2017 UQ Graduate of the Year) and John (2017 UQ Alumnus of the Year) received their awards from the UQ Chancellor, Mr Peter Varghese AO, and from Alumni Friends President, Dr Catherine Lawrence (pictured far right, front row). 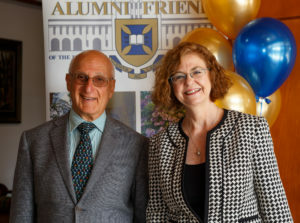 July 2017: Dr David Malouf AO and Madonna King, pictured at the Alumni Friends of The University of Queensland Golden Jubilee Gala Lunch. Attended by over 100 guests, the on stage ‘conversation’ between Dr Malouf and Ms King was a highlight of the Golden Jubilee program. Picture credit: Geoff Lawrence. 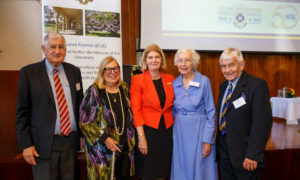 July 2017: The Honourable Penny Wensley AC (Patron, pictured centre), accompanied by the four Foundation Members honoured at the Gala Lunch (L to R: Steve Papas, Dalma Jacobs, Joan Cribb and Don Barrett). Picture credit: Geoff Lawrence. May 2017: The first official event for our new Office Bearers! Awaiting the start of the Reception at Government House. 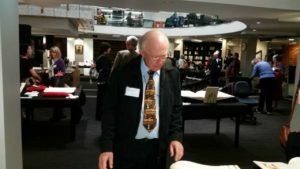 Pictured (L to R): John Martin (Hon. Treasurer and a Past President), Juliet O’Brien (Hon. 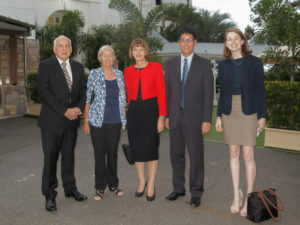 Secretary), Dr Catherine Lawrence (President), Jason Yu (Immediate Past President) and Teagan Thompson (Vice-President). Picture credit: Geoff Lawrence. May 2017: On the steps of Government House. 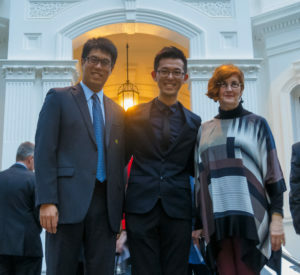 Pictured (L to R): Jason Yu (Immediate Past President) with Jefferson Lee (at the time, our latest member) and Margaret Blaszczyk (Book House Representative, Executive Committee). Picture credit: Geoff Lawrence.